History abounds with tales of mankind’s fascination with Gold. The yellow metal has been considered precious from times immemorial and this fascination is reflected in various references of mining the world over. Kolar Gold Fields, affectionately known as KGF had a very sizable European and Anglo-Indian population who lived and worked there for generations. Messrs. John Taylor and Sons a British Mining Company owned the K G F Mines for more than a century since 1852. It was well known for its Colonial ambience with elegant bungalows replete with huge gardens, green lawns, and many Clubs with Tennis and Badminton courts, Golf courses, Dance Halls, Swimming Baths, etc. It was called “Little England” and was unique for its secular and egalitarian society not found anywhere else in the world. It was one of India’s earliest industrialized towns, which had electricity supplied to it from a captive power plant, good water supply, well-equipped hospitals, schools, etc. The 19th and the early 20th century saw the KGF mines booming and flourishing and it employed almost 4500 employees in its hey days. In what was once a desolate, waste, rocky terrain, a large and flourishing town sprang up which was provided with most of the conveniences and comforts of life at that time. All this was possible due to the perseverance and foresight of a group of British pioneers who were successful in their quest for gold. 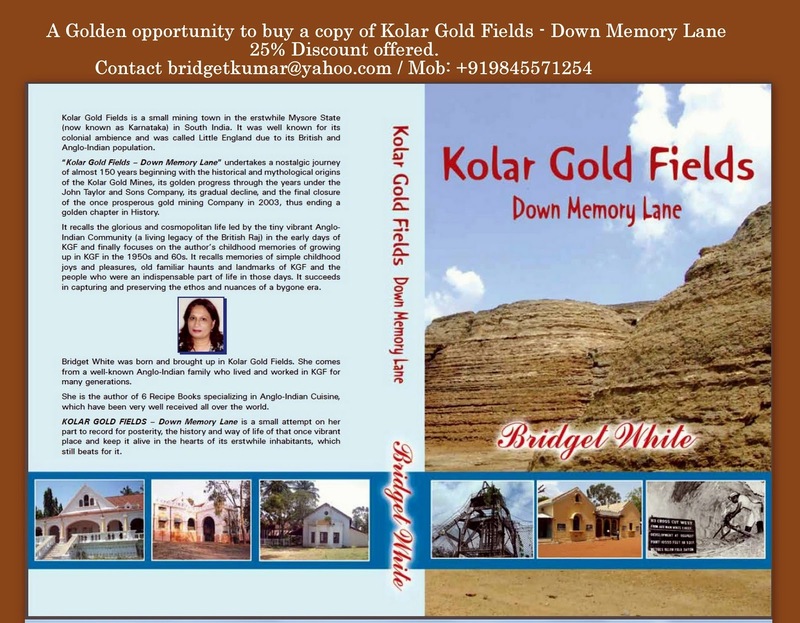 “Kolar Gold Fields – Down Memory Lane” undertakes a nostalgic journey right from the days of the origins of the Kolar Gold Mines, its historical and mythological connections, the arduous and difficult lives of the miners in those early days, the growth of the mines under the British Company of John Taylor and Sons, its gradual decline, and the ultimate closure of the once prosperous Kolar Gold Mining Company in 2003 after it was taken over by the Government of India. Thus ending a golden chapter in History, which now lies buried in the annals of time. It then moves on to give the reader a brief insight into the lives of the Anglo-Indian Community (a living legacy of the British Raj) in the early days of KGF. It brings out vividly the glorious and cosmopolitan life led by that tiny vibrant community in KGF who lived in sprawling bungalows with beautiful gardens and domestic helpers at their beck and call. It recalls the grand Christmas Balls and Dances held at the Skating Rink and the Jam Sessions and Pound Parties in Buffalo Lodge. It finally focuses on my own childhood memories of growing up as a young Anglo-Indian child in KGF in the 1950s and 60s - home, family, school, playmates, entertainments, games, picnics, etc. It recalls memories of old familiar haunts and landmarks of KGF and the people who were an indispensable part of life in those days. This golden period of KGF post Independence was the period of transition, when the influences of the best of old Colonial India merged with the new emerging independent India. This book succeeds in capturing and preserving for posterity the nuances and ethos of a bygone era in that once glorious vibrant place called Kolar Gold Fields, and at the same time keeps it alive in the hearts of its erstwhile inhabitants, which still beats for it. This Book is a small attempt on my part to record for posterity, the story of this once vibrant place and keep it alive in the hearts of its erstwhile inhabitants, which still beats for it. It is a small Legacy that could be passed on to future generations. Copies also at available at Gangarams Book Bureau, M G Road, Bangalore.